『대승기신론의기』는 당나라의 법장(643∼712)이『대승기신론』을 해석한 주석서로서 고려후기에 간행된 목판본으로 上下 2권2책이다. 책머리에는 ‘대승기신론의기권상’의 권수제와 그 아래에 소자로 ‘병서(幷序)’라 기재되어 있고, 다음 행에 ‘서대원사사문법장술(西大原寺沙門法藏述)’이라는 저자 사항이 있다. 판식을 보면 중앙의 판심에 위쪽에만 가느다란 흑 어미가 보이고 판심제 ‘의기(義記)’ 와 권·장차가 기록되어 있고, 사주는 단변이고, 계선이 없고, 1면은 9행 20자 배자되어 있다. 고려후기에 간행된 판본에서 흔히 보이는 판식의 특징이 나타나 있다. 본문에는 구결이 있으며 상권의 표지는 훼손되었으나 후대에 보수하면서 표제는 묵서로 ‘기신론의기상(起信論義記上)’ 이라 써있다. 권말에는 발문이나 간기가 없어 간행연대를 알 수 없지만 판각 및 인쇄상태로 보아 판하본을 써서 판각한 것으로 보이며, 보판도 있어 고려말기의 판본으로 추정된다. 고려본 판식의 특징을 보이고 있는 이 판본은 고려말 간본으로 현재까지 알려진 바가 없는 유일본으로 불교사 및 판본 연구에 중요한 자료이다. 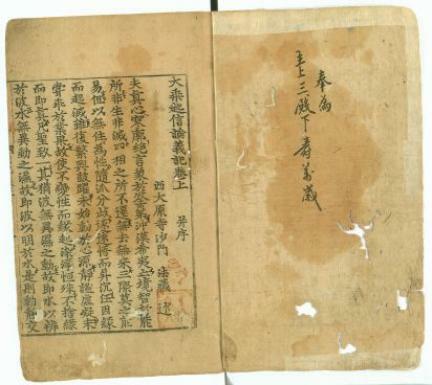 This is an annotated commentary on Mahayana sraddhotpada Sastra (Awakening of Faith in the Mahayana) by the Tang-dynasty monk Fanzang (643-712). 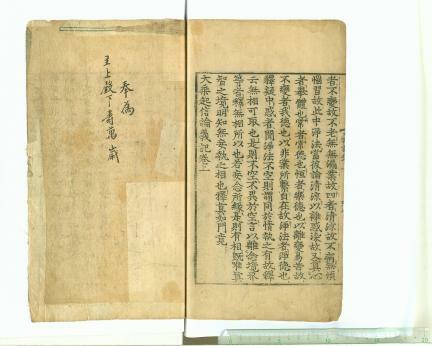 This woodblock-printed edition, published in late Goryeo, consists of two volumes. 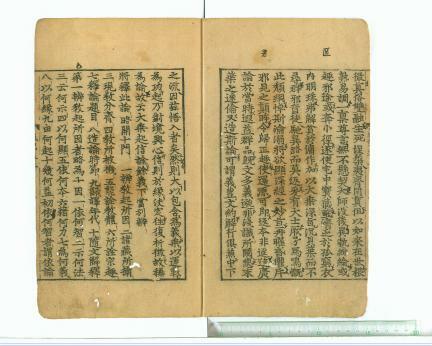 The first volume has the title Daseung gisinnon uigi Gwon Sang (Notes on the Meaning of the Mahayana sraddhotpada Sastra, Volume I), with the word “byeongseo (parallel text)” written below it. 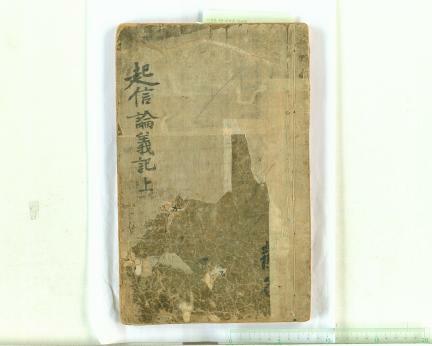 Beneath it is information about the author which reads: Seodaewonsa samun beopjangsul (Commentary Written by a Monk of Seodaewonsa Temple). 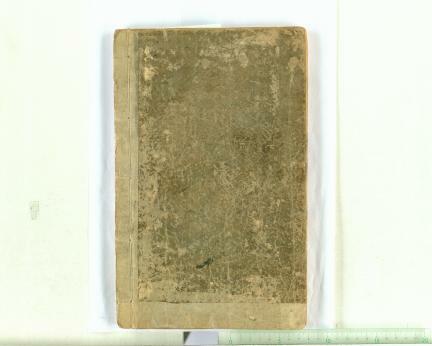 As for the layout of the book, the fold between two pages has a fish tail design against a black backdrop, only at its upper half, along with the title “Uigi” and the volume number and the sheet number. The pages are surrounded by a single black line along the four edges, and there is no line dividing the lines of the text. Each page contains nine vertical rows of twenty characters. 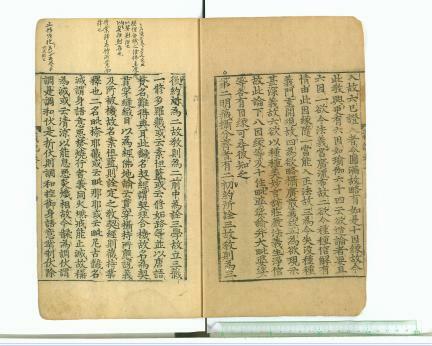 This type of layout is frequently seen in woodblock-printed books from late Goryeo. 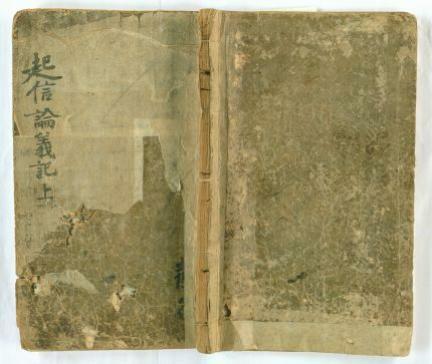 The text has gugyeol (oral formula) markings, and the cover page of the first volume was added at a later time to replace the damaged original cover page. There is no postscript or publishing information at the end of the book. 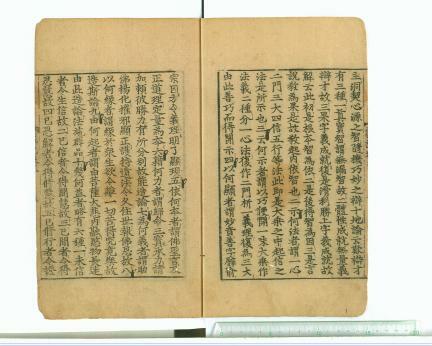 But, judging from the type of woodblocks used and the overall quality of printing, this book appears to have been carved based on a manuscript specially written for the purpose. 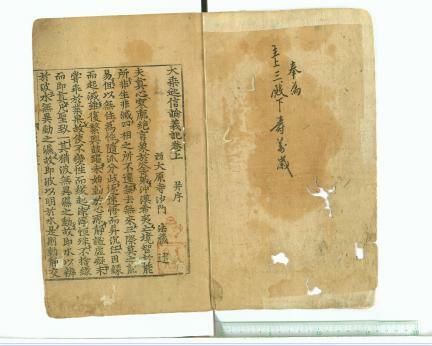 The book also has a bopan (additional prints made for cases where a printed book has missing elements) and is likely to date from sometime in late Goryeo. 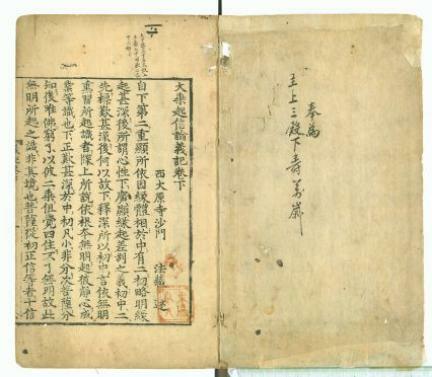 This late Goryeo book is exemplary of the typical style of Goryeo-period woodblock-printed books, and as the only copy of a thus far unknown publication, is quite inestimable in value. It also holds high significance for the study of the history of Buddhism and ancient book editions.